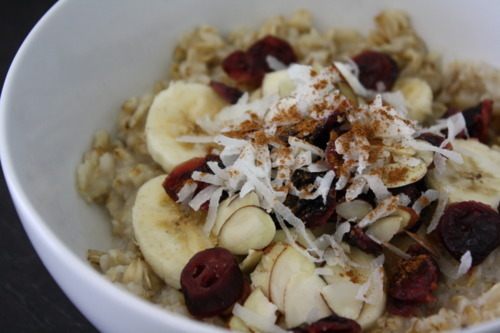 To get this hectic day off to a nourishing start I made some oatmeal & topped it off with some yummy fixings! I recently picked up a bag of “Rolled Oats” from Trader Joe’s. Each serving of their wholesome oats provide 16 grams of whole grain fiber & are gluten free, wheat free & vegan! Perfect for making an “old fashioned” oatmeal, which is just what I needed this morning. In a medium sauce pan, bring water & salt to a boil. Reduce heat & add oats. Cook for 10-20 minutes, stirring occasionally, until desired consistency is reached. Remove from heat, cover & let stand for 2 minutes before serving. So, now I’m off to hit the ground running & should have the energy to do so! I may be back on later today with a lunch/dinner post. We’ll see! If not, see you next week with hopefully lots of photos & a glowing recap of the weekend’s events. Be sure to follow me on Instagram (@vegenista), Twitter & Facebook for updates! I also have a guest post from my good buddy, Andi, queued up for the weekend, so tumblr won’t be totally neglected!